Hush Farms are specialists in off-road 4x4 driving training, delivering LANTRA accredited off-road training courses in Devon, Dorset, Somerset and nationally – meeting HSE regulations for workplace use of 4x4s. Out of 42 fatal injuries on UK farms in 2010-11, 15 of them were caused by overturning vehicles or by people being struck by a moving vehicle. The legal bit: No matter how experienced you are, the law requires you to have proof of adequate training from a qualified person if you use a 4x4 in the workplace. This legislation applies whether you're a volunteer, employed or self-employed. 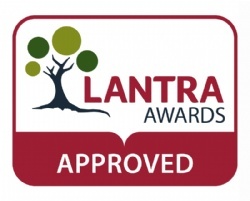 We have a network of LANTRA approved 4x4 off-road course sites around the UK, so you can either come to us in East Devon for your 4x4 off road training, or we’ll come nearer to you. Our 4x4 driver training can be tailored to your specific needs, for 4x4 drivers of all levels, so can include bespoke elements too – from tackling a steep incline, to maneuvering in thick mud. Our industry experience includes working with public and private sectors, government organisations and wildlife trusts. 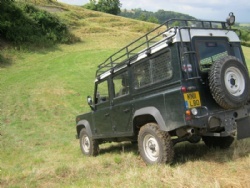 All of our instructors have lengthy experience of working with 4x4 off-road vehicles, in the toughest of terrains, and are qualified to the professional standards set out by LANTRA and NPTC. 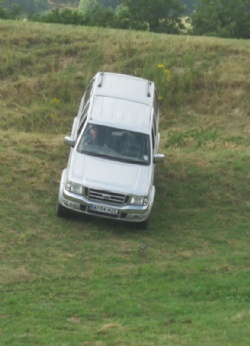 Course objectives: Legislation; 4x4 characteristics; transmission types; traction; vehicle preparation; ascending slopes; descending slopes; safe driving techniques; and recovery. The course caters for all levels of experience and needs for 4x4 Driver Training. It is a LANTRA course and involves Integrated Training and Assessment, designed for operators driving full time or on an occasional basis. Trainees will need: A packed lunch, non-snag clothing appropriate to the weather conditions, strong boots, and your own 4x4 vehicle(s). Please note: maximum of 3 trainees, all must hold a full and current UK driving licence. Prices shown include an approved site in Devon, LANTRA registration and certification.